New Singers are about as rare as flawless emeralds, and even more beautiful. So when this awe-inspiringly green car, officially known as the “‘Manchester’ 1990 Porsche 911 Coupe modified by SVD” showed up, we’ll admit we spent precious minutes just drooling over it. Now it’s your turn to drool, too. 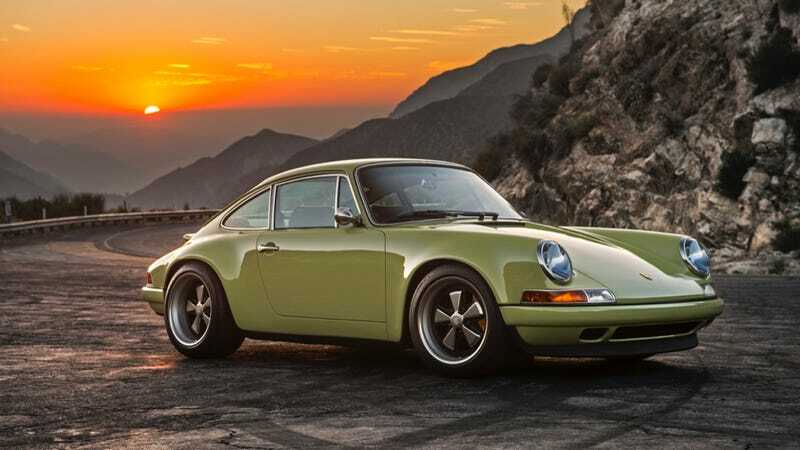 This time, Singer’s famous resto-mod package comes with that fantastic pale green exterior (which the company calls “Wasabi”), a 4.0-liter 390 horsepower engine made by the hot rodders and engineers at Ed Pink Racing, mated to a six-speed transmission and limited-slip differential, and Ohlins-sourced adjustable suspension. Oh, and did we mention that the exterior bodywork was completely done in carbon fiber? Because it’s all done in carbon fiber. But in true singer fashion, this isn’t so much about the outside. It’s about the Helen of Troy-level beauty that lies resplendent inside. All that green and orange woven leather adorning those fantastic bucket seats. That steering wheel with just the perfect thickness. Really, just everything. And at this point, I’m just going to shut up about the car, and let you sit there and bask in all of it. Just remember to clean up when you’re done.